This was one of the rich Victorian gentleman’s “must have” items! The first draw in position as part of the telescope! In those days the landowning aristocracy spent their time “Doing Science”, and the things they needed were a microscope to really understand the small bits of nature, and maybe also a telescope to see the larger animals that moved a bit too fast for them to catch up. So around 1850 the thing to have was a scientific set, which was thankfully provided by the instrument makers of the day – the ones who had identified a good marketing plan anyway. 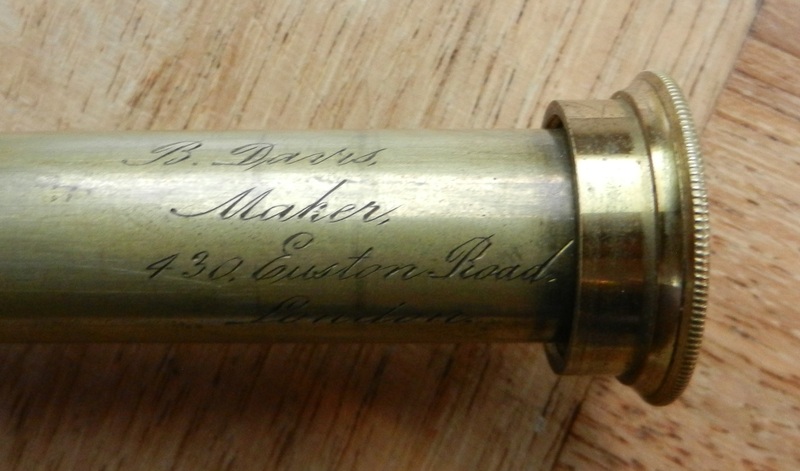 This boxed set was made by B. Davis, of 430 Euston Road, London, as is engraved on the first draw of the telescope. 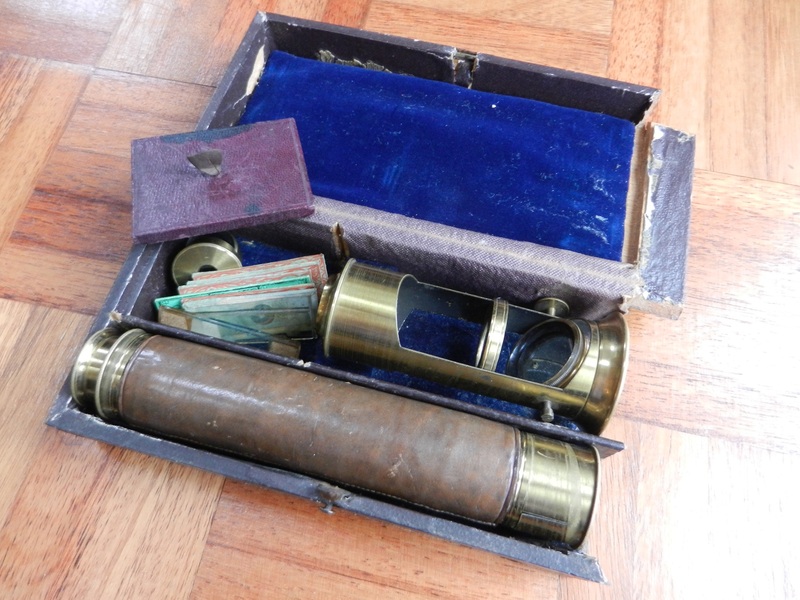 The rest of the set, apart from the box, comprises a microscope stand, some specimen slides to look at, plus an eyepiece with a ruby glass lens, to reduce glare, presumably from an arc light focused on the mirror under the slide. There was also a little glass roofed brass sided enclosure, presumably to enclose a fly or bug or something in the right place under the microscope,to be observed in a trapped area. 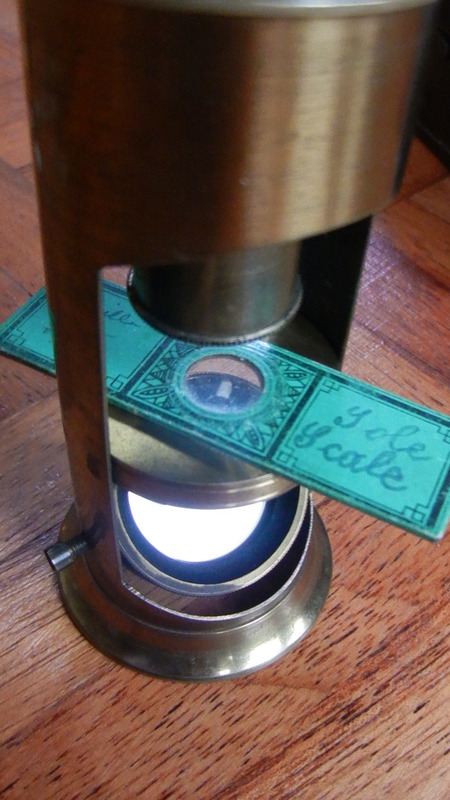 There are several pre-prepared glass microscope slides with the set, which look to be French, and that probably means they were added later. They are labelled, as S**d Po* – Grass (Seed Pod – Grass); Cuticle Onion; Scale – Perch; S**rch – W*ea* (Starch – Wheat? ); Seed Carrier – Aster; Sole Scale (also Scaille de Sole). 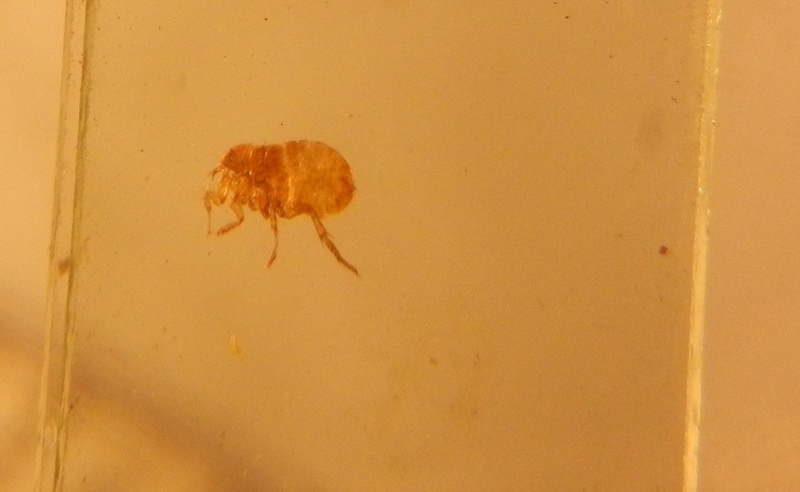 Two others are home-made slides, one is labelled as a “Small spider’s leg”, the other is unidentified, but looks like a flea! The idea behind this scientific set is that the first draw of any telescope, with typically four eyepiece lenses, is actually a microscope: when acting as the first draw of the telescope, it allows the observer to see the small image of the remote object created by the objective lens, positioned just in front of the end of this microscope, but upside down. The eyepiece lenses turn this image the other way up and magnify it. But when this first draw is used separately, screwed into another holder in a vertical position, it creates a microscope in a frame, that is positioned above a specimen slide to be inspected. By using the same mounting threads, in the microscope frame and the telescope body, it all fits together and has a dual purpose….. So this became a great little scientific set to sell to the man with time on his hands, and interest in the developments being made in botany and science and astronomy etc, all at once. The problem really is that these boxes get broken up, and the bits get separated, so it is really good to find a set still with all its components intact. They were manufactured in Victorian times, B Davis was said (in Gloria Clifton’s Directory) to have been an Optician, who attended the London Mechanics Institute from 1830-32, and then lived at 1 Lower Terrace, Lower Road, Islington, London. There are records of an Isaac Davis at Lower Terrace, Lower Road Islington from 1832-38, and then with his brother Marcus here until 1842: they had also traded as Davis Bros.at 33 New Bond Street from 1820-38. But there are also records that show Lower Road was at times called Essex Street, and could indeed have been renamed as an extension of Euston Road, given that the roads around the newly growing railway stations were probably being developed. Since the Clifton Directory covers only the period to up to 1851, possibly this set was produced by B Davis after that date, when the road name had changed. The complete boxed set: the box is missing one of the side panels. 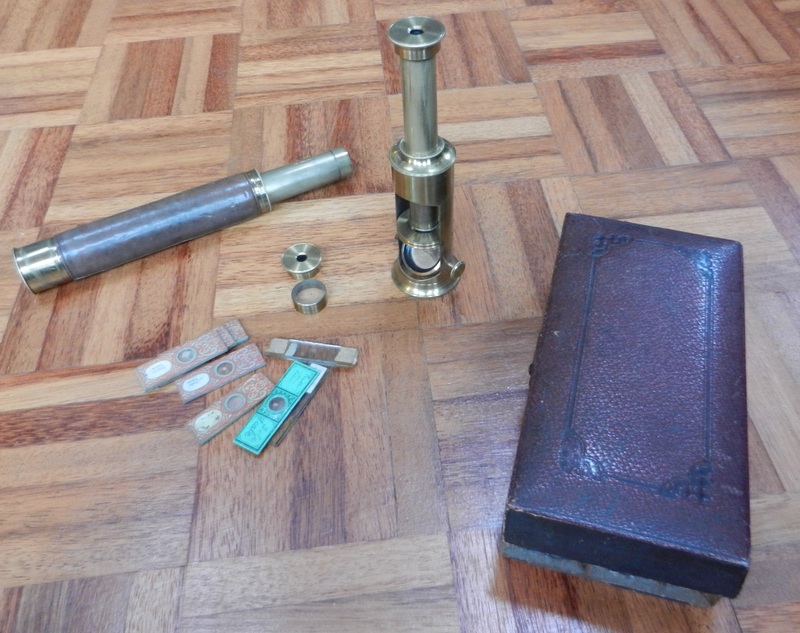 Postscript: The Winter 2015 Tesseract catalogue features a combined microscope/telescope set like this, but in better condition, and earlier, made by W&S Jones in maybe 1790. The microscope specimen carrier is better quality, and the whole thing is in better condition. But that one would cost you $9500. Maybe I should rethink the value of this little set too…or clean it up a bit more, restick the box together! The OOW telescope for RD Graham’s Rough Passage! This telescope was quoted previously in the story describing the dozen or so ‘Officer of the Watch’ telescopes in the collection. The photo shows the main working parts, all mounted in the single draw tube, in two lens cartridges or carriers. 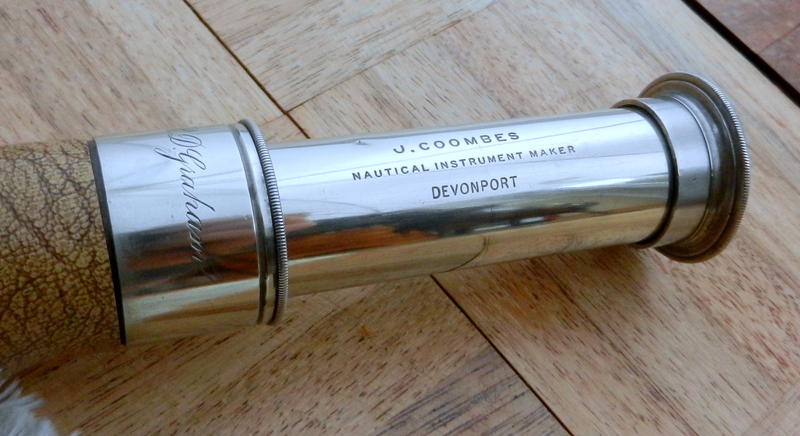 There were quite a few instrument makers based in Devonport and the Plymouth area – one for example was W.C.Cox: this single draw telescope was labelled as made by “J.Coombes, Nautical Instrument Maker, Devonport”. This company is not listed in Gloria Clifton’s Directory, but that only covers makers active before the year 1850, and the telescope is a classic ‘Officer of the Watch’ design, as made by many different people: it probably dates from the 1930s, maybe even later. 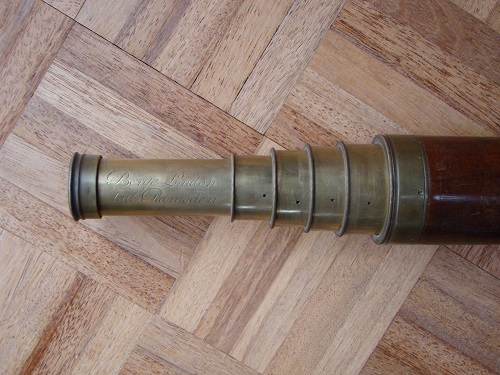 J.Coombes is quoted in reference material as ‘an optical and instrument supplier to the Admiralty from the mid 19th Century onwards’, so it is possible he did build the telescope, and was not just a re-seller. Coombes sextants are often quoted, and there is one in the National Maritime Museum. Nevertheless it is a good quality telescope, and even if only branded by Coombes it could have been made by one of the other OOW makers building for Naval personnel and the Navy, like Cooke, Troughton and Simms. However, the link to W.C.Cox in Devonport could be closer than might have been imagined, as Cox was listed at 87 Fore Street, Devonport in 1851 (by Gloria Clifton), and other instruments made by Coombes are seen to quote his address as 87 Fore Street too (on optical instruments such as some Pince-nez, produced between 1900-1920). An advert from the Victorian era quotes Coombes as established since 1805, and then retailing from 87 Fore Street. 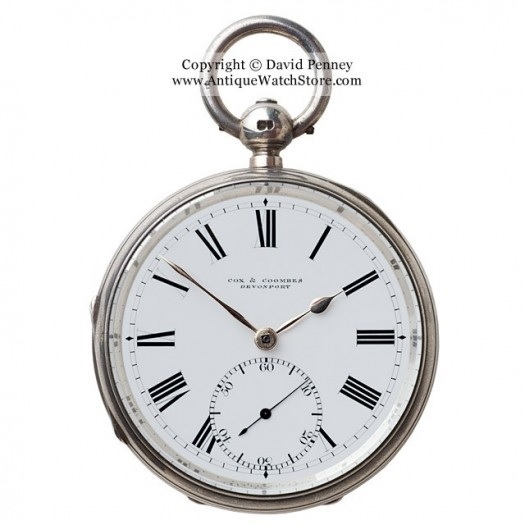 Even better, a silver watch hallmarked for 1887 of ‘Deck Watch quality’ is recorded as having the makers name of “Cox and Coombes” (www.antiquewatchstore.com). Closed up the telescope is 44.5cms long (17.5”), and focused it is 58cms (23”). The sunshade does not pull out (as yet), because of damage on the objective end, presumably sustained falling about on a yacht. The OD is 40mm at the eyepiece ring, and maybe 38 at the objective. 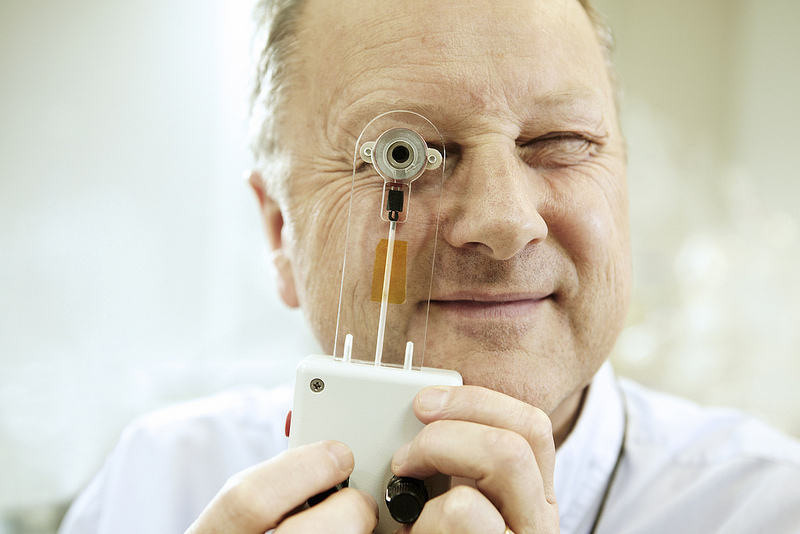 This oversized diameter at the eyepiece is reflected in the excessive lens mount diameter at the end of the first draw, which struggles to pass through the thread inside the barrel. Of interest here though, this lens carrier and its lens are the only parts identified by a number, 6905: this does not occur anywhere else. It gives rise to the question as to whether this could be a later replacement? The single draw and end fittings on the barrel are nicely silvered. 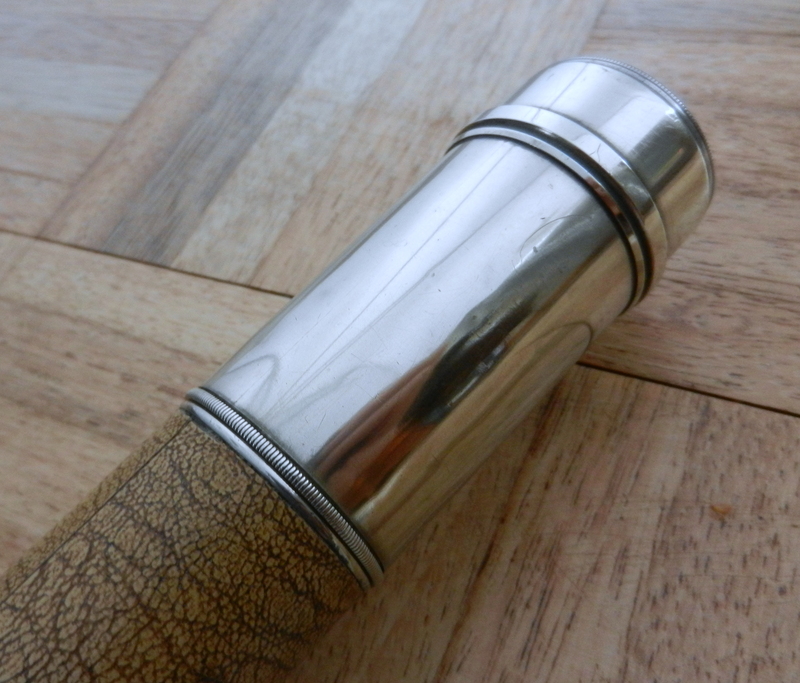 The leather cover on the barrel is glued in place, and is a very thin skin. All the lenses and carriers are in perfect condition, but there is no pin in the eyepiece metal cover to move it across the lens, and no objective cap/cover. The objective mounting ring is badly dented on one side, trapping the sunshade, so the lens will not unscrew. It could be a criticism of the design that the sunshade retracts behind the position of the objective lens ring, not protecting the latter. [But on other telescope models this sunshade edge can be very sharp, when it does stick out]. The owner is identified by the engraving on the shoulder on the main barrel of the telescope, as RD Graham. 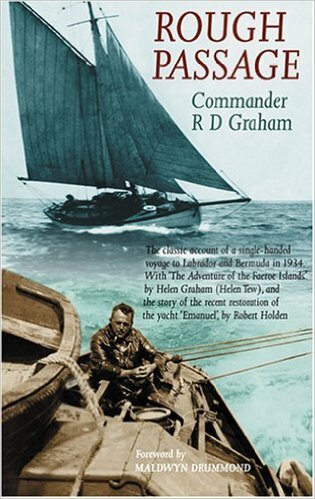 In 1934, RD Graham decided to sail the Atlantic single handed, from the UK (Falmouth) to Labrador, in his 30 foot 7 ton cutter Emanuel. He made the crossing safely, despite having no self steering gear, in 24 days, between Mizzen Head and St John’s in Newfoundland. I am not sure if this was the first single handed crossing of the Atlantic by sail, but the journey was much discussed, particularly as to whether it was an irresponsible act, or showed a spirit of true adventure. So it sounds like he set the scene to encourage single handed yachtsmen everywhere, at least! The story of his journey, and his eventual return via Bermuda and the Azores (with a colleague), after suffering from some form of blood poisoning, is recorded in his book, titled “Rough Passage”. A copy of the book, 2nd edition, came with the telescope, from someone in Warrington, Cheshire, via Ebay – it was purchased in 2004. Naturally I read through the whole account, but nowhere could I find any reference to the use of a telescope to aid this journey, so it is uncertain whether the scope pre-dates the voyage, or was acquired on his return. Graham’s daughter Helen (Tew) also was an adventurous sailor, and made other single handed voyages, even in her 80s. Helen died in 2004.